The 20 HP outboard motor is a popular choice for anglers and boaters – and for good reasons. An outboard engine in the 20 HP class provides enough power for most small to medium-sized, and even some large, recreational watercraft while still remaining relatively light in weight to be easily portable. Whether attached to a Jon boat, sailboat or inflatable boat/dinghy, these lightweight, portable engines have enough power and performance to easily push you and your passengers through the water for a day of fishing, cruising, or just about any type of activity. Add in 4-stroke performance, and you have an efficient and durable outboard that not only boasts of lower emissions and better fuel economy but also one that puts out more torque at low RPMs, is much quieter, and should last you nearly twice as long as a comparable 2-stroke motor. And there’s one more thing to love about the 4-stroke… no more messing around with mixing fuel and oil! But there are many outboard brands from which to choose, and the choices can seem endless, not to mention often costly. But we all want to find the best value for our money. That is the goal of this review. We will take a look at 3 portable 20 HP 4-stroke outboard motors from 3 top marine brands, with each offering its own compelling value, and see which offers the best deal for your money when we consider cost, quality, performance, and warranty. A relative newcomer to the outboard market, the Chinese outboard manufacturer is growing fast. Parsun Outboards, which is registered in the U.S and Canada along with about 100 other countries, started mass production of its inexpensive outboard engines in 2006 and sells to both the commercial and recreational outboard markets worldwide and is the OEM manufacturer of outboard motors for several U.S. brands including Mapi Outboards and premier outdoor brand Coleman. While Parsun as a brand has made significant inroads into the outboard market, in particular in Australia and New Zealand where they enjoy a growing dealer network, expansion into Canada and the U.S., has not been as easy as they face stiff competition from better known, more established brands. In fact, if you are in the U.S. or Canada, finding a Parsun dealer nearby for sales, service or repairs will prove difficult at best. Something else to be aware of is that their 3-year limited warranty covers only parts and not labor for repairs. However, parts are readily available from the manufacturer and, if you are one of those who can and enjoys doing your own service and repairs or don’t mind taking your engine to a reliable independent marine mechanic, then not having a large dealer footprint may not be a deal breaker. But this fact is worth keeping in mind, nonetheless, in any purchase decision. With that said, the Parsun 20 HP 4-Stroke tiller outboard appears to be a solid product and a viable option in a market dominated by a handful of big companies. But right off the bat, I’ll tell you that its biggest selling point may be a price that is significantly lower than the competition – much less than other 4 -stroke 20 HP offerings in many cases. So, if you are willing to take the trade-off of minimal authorized local support for a much lower costing 20 HP 4-stroke engine, then this outboard may just be the best bargain out there, especially given the host of premium features with which it comes. 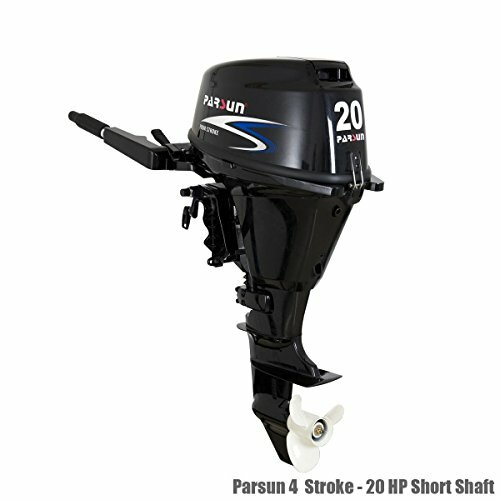 The Parsun 20 HP outboard motor comes with the choice of either a 15″ or 20″ shaft in a package that is designed to deliver exceptional reliability, top performance – and value. It’s noteworthy that the outboard is the only DOHC design (Double Overhead Cam) in this review. That’s quite a feat, given that it is the lowest-priced outboard, by far, in our review. The DOHC configuration provides greater air/exhaust flow for powerful, smooth performance and low emissions while maximizing fuel economy (6.9 L/ 1.8 U.S. gal. per hr) for fishing or cruising out on the river or lake. The motor is a relatively lightweight for a 4-stroke (114 to 123 pounds, depending on shaft and starter option) and compact unit that has the convenience of carrying handles for greater ease of transporting to or from an inflatable boat, aluminum boat or skiff. The outboard comes with the option of a 15″ short shaft or 20″ long shaft. It also comes with a choice of 2 starting systems: manual/electric start and a manual-only option for a generous cost-savings. Regardless of starting system, getting this outboard running is easy with a CDI ignition system, while a start-in-gear prevention feature is in place for greater safety in use. The relatively quiet nature of this motor makes it a practical choice for a wide range of uses such as trolling for fish or simply having fun out on the water. The unit has 4-position tilt and trim capability for complete ease of operation in shallow waters, with drive possible in multiple positions. The Parsun 20 HP 4-stroke carbureted outboard meets both EPA and European CE standards and so outputs lower emissions for a more environmentally friendly experience. It does not, however, meet the more stringent CARB standards (for use in California). The engine is crafted from high-grade marine aluminum alloy to give it the long-term protection needed in harsh marine environments. It also comes with a 3-blade aluminum propeller and stainless steel water pump housing liner for better corrosion protection. Other notable features include a low oil indicator for more reliable monitoring, a water cooling system that is thermostatically controlled, an emergency shut-off with safety lanyard, and a vibration reduction system for a smooth ride. Mercury Marine is the largest and perhaps most recognized brand of marine engines in the world. They have been producing some of the best outboard motors for almost 80 years, ever since Carl Kiekhaefer turned a converted barn in Cedarburg, Wisconsin into a small machine shop. But the Mercury 20 HP 4-Stroke Outboard is actually built by another legendary outboard manufacturer, Tohatsu. Yes, the name on the side may say Mercury, but the engine is built at Tohatsu’s facility in Japan. In fact, this outboard, with minor variation, is basically the same engine as the Tohatsu offering (not something you read much about in Mercury or Tohatsu outboard reviews). That’s right. But I don’t want to digress too much – more on that later. Ok, so what are the merits of the Mercury 20 HP Electric Start 4 Stroke Outboard Motor? For one, you get exceptional all-around performance backed by a 3-year factory warranty from the premier marine propulsion company in the world. Mercury’s extensive dealer network for service and repairs is also a big plus when considering this outboard. You won’t have to search too long and far to find an authorized service center – that’s peace of mind. Now, for the engine itself. The Mercury 20 HP comes with either a 15 or 20-inch shaft, manual tilt and delivers the low-end torque that is necessary to get a boat to plane with complete ease. Its throttle response is quick and crisp when it comes to acceleration, thanks to the tuned intake manifold. This motor will have no problem moving you effortlessly across the water to your favorite fishing spot. The multi-function tiller handle is designed to operate single-handed for complete ease in steering, tilting, throttle control, stopping and shifting. Operating this outboard is almost effortless. Mercury 20 HP models are built with a few exclusive features to give you the best all-around performance, such as a multifunction tiller, vibration-absorbing wishbone mounts, auto-ratchet tilt with 6 manual positions. The electric start is quick and efficient with a no-primer button and a 3-position choke to simplify the process as well as improve the rate at which the engine warms up. This outboard motor is lightweight (about 118 lbs) and is built with the durability and reliability generations have come to expect from Mercury. One of the key features of this engine is that it runs clean and efficiently – it is CARB 3-Star ultra-low emissions certified and economical in its use of fuel. In fact, this 4-stroke outboard has the ability to consume nearly 40% less fuel than alternative 2-stroke units for exceptional running costs and savings. Overall, this Mercury 20 HP Electric Start 4-Stroke Outboard Motor is the perfect unit to deliver portable power for your small boating needs. It runs amazing and is really easy to install. Plus, it gets up and goes fast really quickly, while also being very maneuverable. The only possible drawback, voiced by some owners, is that the motor can be slightly loud at idle. Though not a household name in the U.S., Japanese outboard manufacturer Tohatsu is an industry leader and has been building quality outboard engines since 1956. Tohatsu is the second largest outboard manufacturer in the world and continues to produce some of the best 2-stroke and 4-stroke outboards on the market in their Komagane facility, which boasts having the largest outboard motor production capacity in the world. Through the years the company has also partnered with industry heavyweights including Nissan and Mercury to manufacture outboards for their own marine lines. Though Nissan discontinued global sales of their outboard engines in 2014, Tohatsu continues to provide parts, service and warranty support for all Nissan outboards still in the marketplace. The manual-start Tohatsu 20 HP 4 Stroke Outboard Motor offers unsurpassed quality and performance for boaters with its lightweight build (114 lbs for the 15″ shaft motor and 117 lbs for the 20″ shaft offering), powerful 2 cylinder SOHC (Single Overhead Cam) design, Advanced Digital CD Ignition System, tuned intake performance and a host of other premium features. The Tohatsu 20 HP outboard comes in a sleek, lightweight and compact design that makes it relatively easy to handle when transporting it to and from your inflatable dive boat or fishing craft. Six-position tilt and trim make maneuverability in the shallows a breeze. The latest cross-flow induction technology helps to create the smoothest ride and operation possible, while the tuned intake system is great for efficient and quick takeoffs. The outboard is built to have significantly reduced induction noise to produce a much quieter and pleasant ride. The low maintenance design of this outboard makes it easier to service, with its large capacity oil reservoir for complete ease in lubrication and a canister-style oil filter to really simplify the replacement process. The saltwater-rated Tohatsu is built to weather the elements. It is made from high-grade marine aluminum alloy, has a stainless steel water pump housing and comes with a sacrificial anode to protect the motor from electrolysis. The anode also serves as a trim tab to improve steering and performance. A high-grade, 3-blade aluminum propeller will provide years of worry-free operation. Other useful features include the ESG over rev RPM limiter, the low oil pressure warning system, decompression device for quick starting and start-in-gear protection/neutral safety switch. 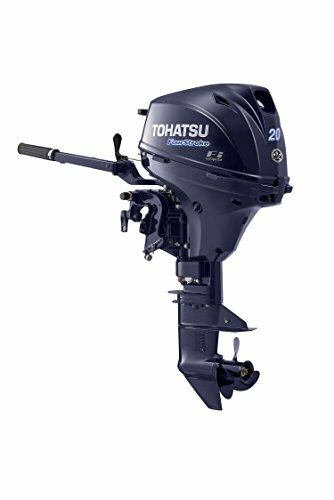 To summarize, the Tohatsu 4-stroke 20 HP outboard is an excellent portable choice for medium to large inflatables, pontoon boats and Jon boats with its lightweight engineering, high durability, exceptional fuel efficiency, low maintenance features and a best-in-class 5-year factory-backed warranty. When I wrote the review a month ago, I chose to review the Tohatsu 4-stroke 20 HP with manual start/manual tilt even though there was an electric start with power tilt model available. My reasoning for doing so was that the review was about getting the best value for your money in this outboard class. While features like Electric start and power tilt are welcome options that certainly make life out on the water a little easier, they did not appear to me to bring enough value to justify the significant cost increase they represented at the time. The base model was the better deal. However, since then some things have changed and changed for the better. Tohatsu came out with an outboard that offers such an increase in value that I felt compelled to update this review. The new and improved Tohatsu 2018 4-stroke 20 HP engine (15″ shaft, manual start/tilt & 20″ shaft manual start/tilt) is an impressive upgrade to the one first reviewed here. Well, to put it in a nutshell, the new model is a remarkable improvement on just about every front, not just a couple. Let’s start with what was really the only glaring weakness of the previous model reviewed – the manual start only feature. That is rectified in the new 2018 MFS20 lineup with the introduction of a Digital Electronic Engine Control Unit across the board. You’ll still have a manual option as a backup, but starting your engine just got easier and quicker in any environment. Of course, if you still want the manually-only start system for the savings or just preference, it will still be available in both the 15″ and 20″ shaft size offerings. Two versions of the outboard also come with integrated tiller-handle power tilt. 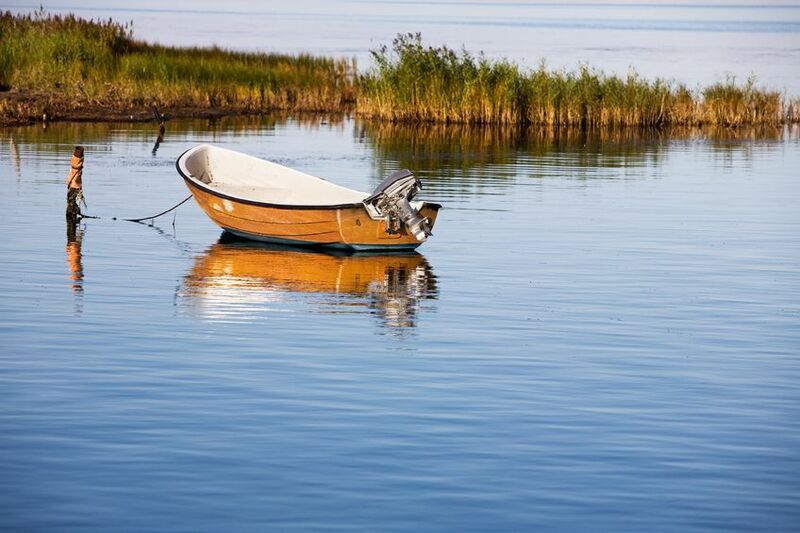 The push-button, multifunction tiller handle makes tilting the engine in and out of the water a breeze. Gone is the carburetor. Though it was an efficient, ultra-low emission CARB 3-Star design It is replaced by a Battery-less Electronic Fuel Injection (EFI) system that will allow you to cover roughly 50% more water while improving your fuel economy and emissions. Another welcome benefit of an EFI system that does not require a battery is that it reduces the weight of the outboard, making the 2018 Tohatsu 20 HP the lightest motor in its class. To give you an idea of the weight-saving improvement, the manual-only start 15″ shaft model weighs in at a mere 95 lbs while the feature-rich electric start, power tilt 20″ shaft version weighs at just 118 lbs. These are the significant changes to the Tohatsu 4-stroke 20 HP outboard. There are some other tweaks such as a slightly smaller displacement of 333 ccs vs the old size of 351 ccs, but otherwise, all else remains the same rock-solid Tohatsu product of the initial review. The prices remain as competitive as they were before, even with the enhancements. And that remarkable Tohatsu 5-Year Warranty is there too in this new outboard! The 3 outboards reviewed here represent some of the best small outboard motor values on the market today. From that point of view, whichever you end up buying will most likely be a good choice. The decision on buying anything, outboards included, is often based on our individual tastes, needs, budgets and so on. So, while we may judge one of these outboards to be the best deal or value based on criteria including cost, features, and warranties, ultimately the best value will vary depending on your what is best for your situation. The Parsun 20 HP. Let’s get right to it – one of the biggest reason for considering the Parsun over the other 2 choices is the price. It is the price is significantly lower than the Mercury and the Tohatsu. But it doesn’t lack in quality as it comes with a host of features found only in more expensive 20 HP motors such as DOHC design, marine-grade aluminum alloy construction, and CDI Ignition. But there are some things to keep in mind. They are manufactured (but many U.S. companies outsource to China, and they are an OEM supplier for Coleman and other U.S. outboard brands). Their 3-year Limited Warranty that does not cover labor costs. In the absence of a major dealer/authorized repair center network in the U.S and Canada, I would buy this if I were working on a tight budget and primarily concerned with the savings, felt confident enough to work on the engine myself or have a trusty and reasonable marine shop/dealer repair center nearby. Mercury has been making outboards since 1939 and is one of the World’s top brands. However, as I stated previously, Tohatsu is the actual manufacturer of Mercury’s 20 HP 4-stroke motor as well as all of their outboards under 40 HP. It’s no coincidence that both the Tohatsu and Mercury engines are both made in Japan, come with 2 cylinder SOHC designs and 351 ccs (21.4 cubic inches) displacement, have the similar bore and stroke (61 x 60 mm / 2.40 x 2.36 inches), come with an identical full throttle range or WOT (wide open throttle) of 5400-6100 RPM and so on – they are essentially the same outboard motor repackaged, with some minor variations. Most of those variations are peripheral to the motor itself – things such as the Mercury having an electric starter as opposed to Tohatsu’s manual start on this model, and Mercury’s external fuel tank is larger at 6.6 U.S Gal. (25 L) to Tohatsu’s at 3.1 U.S. Gal., or just under 12 L.
However, having said that, if you are looking for name brand peace of mind and the customer support, etc. that comes with it via a large U.S. and global network of outboard dealers and repairs centers, the Mercury offering here makes a lot of sense. That and the fact that this is the same high-quality motor offered by Tohatsu, make this a solid choice as well. If it only had a 5-Year Warranty, it would have been a closer call between the 2 outboards. Though similar in almost every aspect, there are two considerations separate these 2 otherwise twins. The first is the retail price of the motors. You are going to pay a little more for the Mercury because it has the electric starter and …well, it is a Mercury after all and therefore can sell at a higher premium. The second and most important point of separation between the two is Tohatsu’s factory-backed limited warranty is for 5 years as opposed to Mercury’s 3 years. That is a very big deal, given that everything else is pretty much equal between the outboards. While both motors offer outstanding performance and value, I can’t justify buying Mercury’s outboard when I can buy virtually the same motor for roughly the same cost while getting an additional 2 years of warranty! There’s no question as to which outboard in this review offers the best all-around value – that’s the Tohatsu 20 HP 4-Stroke! This entry was posted in Tackle/Gear Reviews & Guides on September 21, 2017 by Dorado. “and should last you nearly twice as long as a comparable 2-stroke motor” and that’s when i realized it was all BS, a four stroke outboard would be lucky to see a quarter of the life of a 2stroke, i will pit my 1969 johnson 25hp 82lb 2 stroke that runs as good as the day it was sold still original pistons and rings and gets 120 on both cylinders against any of the motors you listed, i can guarantee that 20 years from now mine will still be running at 70 years old while yours will be trashed after 15 years tops even with regular maintenance. Welcome, This Guy. I humbly have to disagree with you. Now, the 2-stroke has been around forever and may have a few advantages (the 4-stroke has plenty of advantages too!). Things like being lighter and less expensive than a comparable 4-stroke, as well as having generally better acceleration. I’ll also add that because of its simpler design and fewer moving parts, it is easier to service. But longevity is not an advantage it has over the 4-stroke. The 4-stroke’s dedicated lubrication system does a better job of keeping the internals operating smoothly. The classic 2-stroke lacks this, instead using a mixture of oil and gas to provide both internal lubrication and power. That, in the opinion of many, is the biggest contributor toward engine quicker engine wear in a 2-stroke. Another factor is that the 2-stroke runs at higher RPMs. Higher revs reduce engine life. Now, the importance of proper maintenance with any engine cannot be overstated, and it sounds like you have done a remarkable job in that department with your outboard. I have no doubt you’ll get another 20 years out of it! Thanks for the detailed and helpful review. Didn’t know about the Tohatsu-Mercury relationship.The 5 year warranty makes the choice easy. Hi Mike. Yes, it certainly adds value to an already good outboard.